VietNamNet Bridge – A 31-year-old man from HCM City burst into tears 11 months ago when his daughter visited him for the first time at Detoxification Establishment No 3 in Binh Duong Province. “My wife and mother bring her to visit me every month. I’m trying to give up drug addiction and find a stable job so I can take care of my daughter,” he said. Located about 100 kilometres from HCM City, the Detox Establishment No 3 teaches trainees about the harm that recreational drugs such as ectasy and amphetamine-type stimulants can do to the body and mind. They also receive vocational training such as sewing, computer assembly, and motorbike and electrical appliance repair. “Vocational training is designed based on their needs,” he said, adding that the establishment works with the Continuing Education Centre at the city’s Youth Volunteer Force to introduce them to jobs. Another former addict, a 36-year-old man from Ba Ria-Vung Tau Province, takes part in a healthy routine every day. “I do exercise every morning. After breakfast, I weave chairs to earn money for my life after I leave here.” After working hours end at 4:30 pm, he plays sports with his peers at the establishment. “The life here is comfortable,” he said, adding that exercising and sports had improved his health. He will also begin learning how to repair electrical devices. 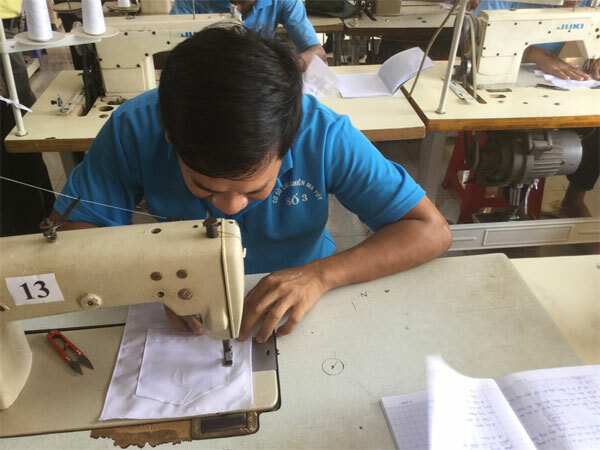 Another resident, a 25-year-old man from Binh Thuan Province, said that he was learning how to sew and will work with his family after he returns home. Of the 1,270 residents at the establishment, 86 per cent have used recreational drugs and have mental disorders such as paranoia, hallucinations or depression. Nguyen Tuan Anh, deputy head of the Social Evils Prevention Division under the city’s Department of Labour, Invalids, and Social Affairs, said the Government subsidises all costs at public detoxification establishments in the country. Truong Quang Nam, director of Detox Establishment No 3, said the state subsidy for meals is VND37,000 (US$1.6) per day per person, increasing to VND111,000 in holidays and VND185,333 during Lunar New Year (Tet). The total subsidy for other daily needs is VND1.2 million ($51.7) per trainee for one year. The Detoxification Establishment No 3 is working with the health division of HCM City’s Youth Volunteer Force to upgrade its facility for methadone substitution treatment this year, he added. Activities and programmes that improve mental health of the residents are being carried out at detox establishments in the country. According to Cong, residents can go home before their due date ordered by the court if their detoxification results are positive. Anh said that under the Law on Drug Prevention and Control, the country offers one of two methods for drug addicts, including voluntary or compulsory detoxification, under three forms: family and community, and private or public establishments. For family and community, addicts have to declare their addiction status and voluntarily register for either a detoxification programme or treatment with methadone. If addicts fail to voluntarily register, local labour and health staff will educate them about drug abuse. After that, the addicts take part in detoxification at local health facilities or with doctors who visit the family home. If they fail to participate, the court will demand that they take part in compulsory detoxification establishments for one or two years of treatment. The Government now views drug addiction as a chronic disease caused by brain disorders. Treatment needs a long period and includes comprehensive interventional methods that help educate the addict about illegal drug use and its dangers. As of November, there were 120 drug detoxification establishments in the country, including 105 public ones, according to a report from the Social Evils Prevention Department under the Ministry of Labour, Invalids, and Social Affairs. The number fell by 25 compared to the years before 2014, Hien said. Of the 105 public establishments in the country, six are for compulsory treatment for people who have refused to voluntarily register for a detoxification programme or take methadone. Courts throughout the country have issued decisions on compulsory detoxification for 26,208 people, leading to an increase in the total number of residents at detoxification establishments to 34,483. Only six provinces and cities in the country carry out community- and family-based detoxification, with a total of 4,320 addicts. The Ministry of Labour, Invalids, and Social Affairs manages 31 establishments that offer only methadone treatment, with a total of 4,141 addicts. Eleven of the country’s voluntary detoxification establishments have also been upgraded to offer methadone treatment.